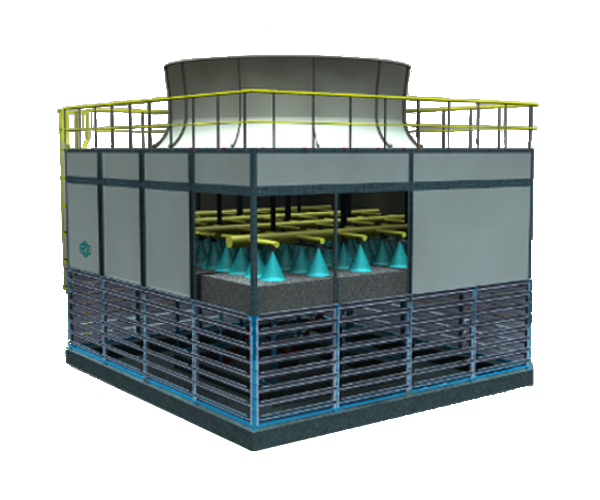 Here a complete guide on how to establish an optimal water treatment system for cooling towers. What is the aim of an automatic make-up system? Which is the role of a proper chemical treatment? 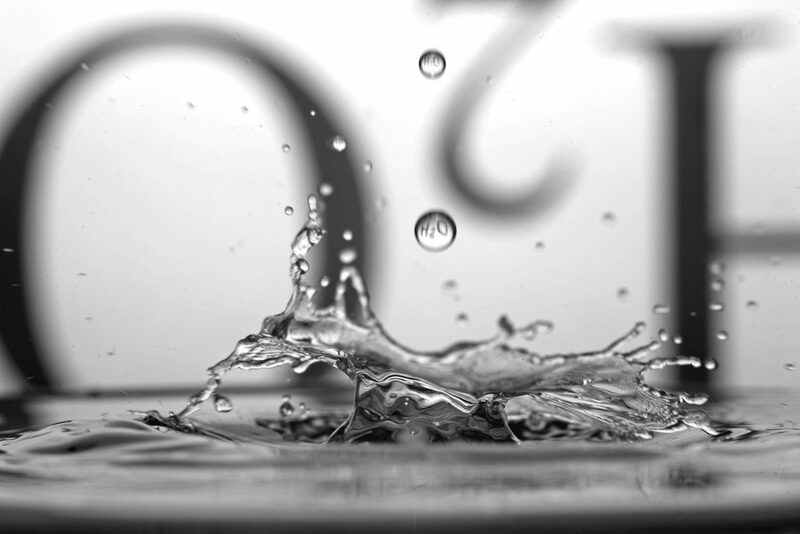 How to maintain the circulating water at optimal operating limits? And why is it useful to leverage on osmotised water while treating water in a cooler? All questions your process cooling advisor can answer. First of all, let us see how a cooling tower operates. Evaporative cooling towers, used to cool water, are extremely high energy efficiency systems. By forcing the evaporation of a small amount of water, they lower the temperature of the rest of the circulating water mass. At maximum potential, the amount of evaporated water is approximately 2% of the entire circulating mass. Therefore, using the latent evaporation heat makes it possible to work at temperatures close to wet bulb temperatures, and therefore achieve very low operating costs compared to cooling by means of chillers or running water. 2. What happens to the circulating water? A system designed with a cooling tower cannot be considered a completely closed circuit since there is a direct exchange with the air, nor a completely open circuit, because most of its water is recirculated. 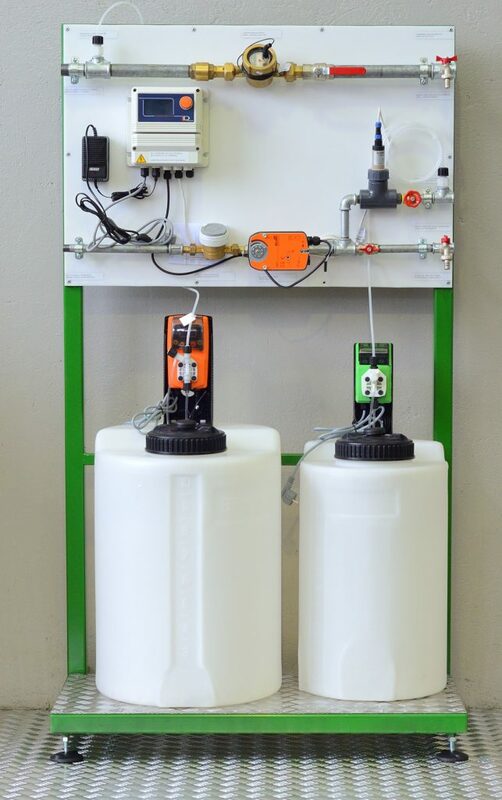 Due to evaporation, the water level needs to be replenished by an automatic make-up system. Fouling and pollution due to contact with air: to achieve evaporation, large masses of air are forced into the exchange pack making the evaporative tower clean and remove dust from the incoming air that may contain dirt, organic matter and possibly pollutants. Fouling and pollution due to contact with the equipment to be cooled and, if applicable, to the direct cooling of the pieces. Continuous increase of salt concentration in the water, including any polluting elements mentioned above. Due to the evaporation of part of the water, which can be regarded as being distilled, and its consequent make-up, the salinity of the circulating water would continue to increase, lacking adequate purging. Increase of bacterial load and growth of algae/biofilm due to favourable conditions (light, organic matter, temperature, oxygen level). Due to the foregoing, without proper management and chemical treatment, the circulating water would soon adversely affect the cooling system and decrease the exchange yield of both the tower and the entire circuit. Widespread fouling, particularly located on the exchange surfaces. It should be noted that the formation of a small fouling film would isolate the exchange surfaces involved (which have high thermal conductivity), rapidly lowers the system’s efficiency. Over time, the continued fouling would increase the film, until it becomes a thick and insulating layer, which would clog the cooling and tower packs. Localised or widespread corrosion. Besides occurring by direct contact with the cooling water, corrosion can also occur underneath the fouling deposits (under-deposit corrosion). This phenomenon is very dangerous for the system, as it could cause damage to the equipment, and therefore lead to cooling system downtime. Development of algae and biofilm, which lower the heat exchange efficiency, can clog the passages and determine health safety implications. At present, the guidelines expressly recommend that the system be managed optimally in terms of bacterial proliferation control. It should be noted that the phenomena described above increase their effect when they take place concurrently. Hence, in order to maintain a safe and efficient management over time, it is important to operate the plant optimally with respect to all parameters. Size and potential of the plant. Generally, small plants require simpler systems, while large plants need more complex ones. Degree of automation required to minimise the work of the personnel involved. Need for automatic adjustment according to changes of the thermal load. Budget required for the treatment system and its operation. Generally more complex and complete systems involve lower operation costs, making them more suitable for medium/large supplies having a substantial number of working hours per year. Conversely, simpler systems have a lower purchase cost and are suitable for small capacity plants or those used occasionally. Type of process, operating conditions and quality of supply water. Specific needs (for example, required by the process or by the manufacturer of the equipment to be cooled. Monitoring and maintaining the correct salt concentration in the water. For this purpose, an automatic purge system must be installed. It should be implemented with different operation strategies according to different demands and operational conditions, by maintaining the water’s concentration within the limits manageable by the treatment. Control and minimise fouling risks. To protect against fouling, it is important to adopt and achieve synergy among the automatic purge system, the chemical conditioning product and the water pre-treatment system, if present. Control and minimise corrosion risks. To avoid corrosion, it is important to adopt and achieve synergy among the automatic purge system, the chemical conditioning product, and suitably select the system’s construction materials. Bacteria growth control. To protect against growth of algae and biofilm and to maintain acceptable operating conditions, it is important that the use of the sanitising product be supported by materials and constructive choices made to minimise this phenomenon. As mentioned above, it is possible, and often advisable, to add water pre-treatment such as softening or osmosis processes to the system. Usually, the best compromise among results, operating costs and consumption reduction, is obtained by an adequate softening system that is able to completely – or partially – reduce the hardness of the water, thus allowing deeper concentration cycles. By doing so, it is possible to reduce the consumption of water and products and at the same time, thanks to the higher concentration, to more effectively protect the system and increase safety against the negative effects of failure of part of the treatment. The graph below compares overall water consumption, taking into consideration hard, soft or osmotised water. The graph clearly shows that lower overall water consumption is obtained by using soft water. This is achieved thanks to the good concentration ratio obtainable and the little water necessary for resin regeneration. Conversely, the osmosis water supply solution is theoretically optimal if only the volumes of water in the tower are considered. 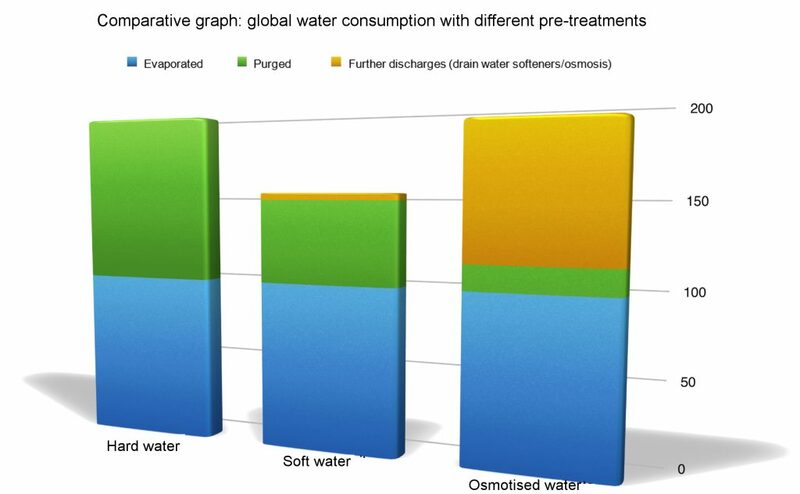 However, the substantial impact of wastewater due to the osmosis process brings the general consumption close to that obtainable from hard water. As concerns supplying osmotised water, the significant consumption of electricity and antiscalant should also be taken into consideration. Therefore, the use of osmotised water in a tower is only advisable where it is technically required and indispensable. The circuit water concentration factor, which is the ratio between the make-up water and the water purged from the system, and that directly influences water quality in the circuit, its consumption and chemicals, depends on several factors. The most important ones are certainly the quality of supply water (strongly influenced by pre-treatment), the operating conditions and the type/quality/quantity of conditioning products used. In general, if no specific limits are set for the plant, the concentration factor must allow the salts present to be kept in a solution, avoiding their precipitation, taking into account the factors mentioned above. For information purposes, the concentration factors attainable, in average conditions of temperature and water quality, are between 1.5 and 2.0 times for hard water, between 2.5 and 3.2 times for soft water, and between 5.0 and 8.0 times for osmotised water. Since the water available varies by area, a unique and unambiguous management process cannot be defined. Therefore, an overall assessment of the system must be carried out to determine the best approach. One aspect to consider when choosing the type of supply is also the consumption of conditioning products, which significantly influences the plant’s operating costs. Below is a comparative graph of the various solutions. 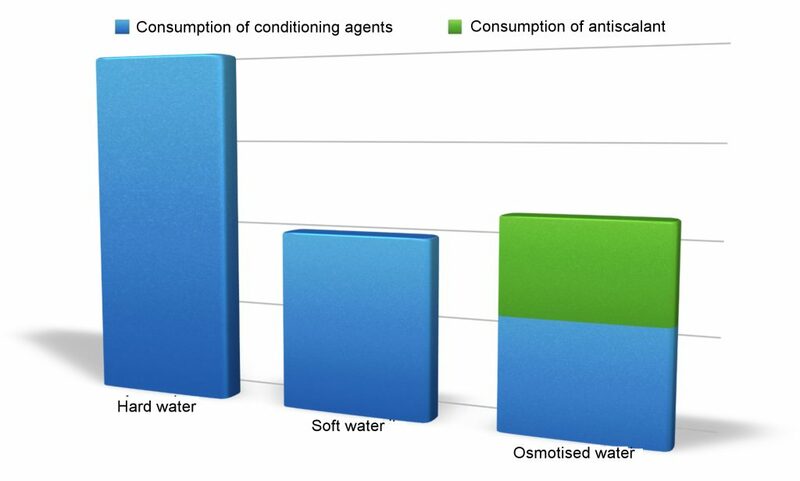 The graph clearly shows that use of soft or osmotised water determines a remarkable saving of overall quantities of chemical product, compared to the use of hard water. For information purposes, if using hard water in the circuit, the treatment system as a whole will be more targeted to reduce the fouling factor, compared to the corrosive effect due to water in the circuit, vice versa if using of soft or osmotised water. The installation and the proper management of a suitable treatment system ensures stable operating conditions for the cooling system and high efficiency over time. Automatic systems can optimally operate towers and require limited operational work. 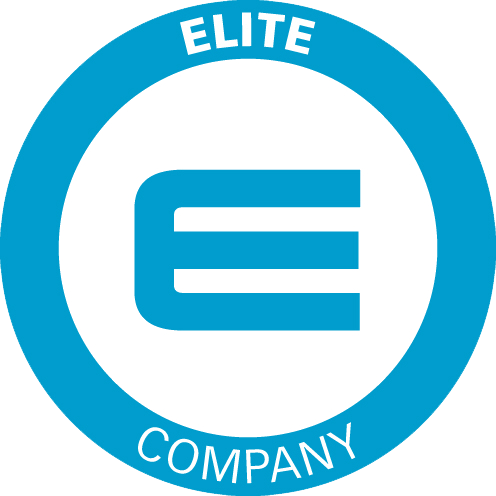 By evaluating the specific requests of each system appropriately, it is possible to identify the correct management system, with different degrees of complexity, to ensure the required performance at an acceptable operating cost. Despite the higher initial cost, the adoption of more comprehensive treatment and pre-treatment systems reduces system operating costs. These are therefore always recommended when the average thermal capacity of the plant begins to have a high impact.